Ibizian imprint Chronovision bring you ‘This World’ by Anëk Feat Robert Owens backed with remixes from DJ W!ld, Veitengruber and Lee Brinx. Denise & Karina Jensen aka Anëk originate from Copenhagen in Denmark and burst on to the scene earlier this year when joining ViVa Music on their Be-At TV Stream. The duo went on to release the single ‘Come Out To Play’ later that year via Steve Lawler’s label. 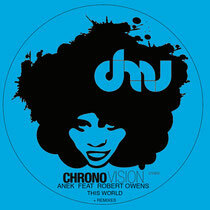 Anëk also featured on Chronovision’s inaugural release with ‘Time Is Now’ garnering support from the likes of Arnaud Le Texier, Mihai Popoviciu, Audiofly and Darius Syrossian. The Danish duo team up with house veteran Robert Owens here to deliver ‘This World’. The original cut opens the release, a raw acidic style track with Owens’ unique, heartfelt vocals. Driving percussion and a gritty electronic bass fuel the movement while the vocals add to its musicality, resulting in a stylish house track. Next up is Rekids artist and Circo Loco resident, DJ W!ld with his ‘One More Time’ interpretation. The French producer stamps his signature percussive, groove-led stamp on the original, employing crunchy drums to lead the way and introducing small vocal snippets to the breakdown points in the track. Veitengruber is up next, a purveyor of the Mannheim sound through productions for 8bit and Plastic City he delivers a hooky, drum-led remix that relies on subtle additions to the groove and an innovative marimba style melody to create something refreshing. Closing the release is Lower East’s Lee Brinx, providing a contrasting mix of old school house with its retro organ bassline, shuffling claps and raw energetic feel. Released last week, check it out below.